Many companies across a host of industries are looking at cross-functional business processes to provide better customer-centric services. Companies want to understand and react faster to the immediate concerns of a customer by improving on activities such as customer service, campaign management, and real-time fraud detection. These services require the ability to access and update an integrated, consolidated, current view of detailed operational data. 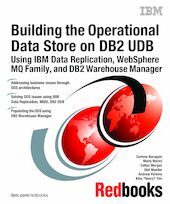 In this IBM Redbooks publication we describe how an Operational Data Store (ODS) can be used to address all of these business issues. We describe how an ODS fits within the business intelligence architecture, and we explain the differences between the ODS and the data warehouse. The capabilities of IBM Data Replication, WebSphere MQ Family, and DB2 Warehouse Manager are explored to show how they can be used to integrate heterogeneous legacy systems and solve many of the ODS issues. Various data integration and transformation methods are described. We show how DB2 Warehouse Manager can be used to manage and monitor the population subsystem. We also take an in-depth look at how DB2 UDB EEE for UNIX and DB2 UDB for z/OS can be used as target ODS databases.